Passengers of Mumbai Rajdhani will get SMS alerts before arrival of their destinations during night hours with the railways launching the service on Wednesday. 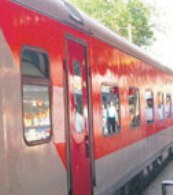 August Kranti Rajdhani Express between Mumbai and Delhi will have SMS alert facility from Wednesday, said a senior Railway Ministry official, adding that the service will be available during the period from 11 p.m. to 6 a.m.
"The aim is to make the passengers alert before arrival of their destinations during the night journey. They will get the alerts in their mobile phones," said the official. The alert service will be extended to other trains in a phased manner. In line with the Digital India campaign, the railways will also launch a mobile application for paperless unreserved ticketing system for Mumbai suburban commuters and Hindi version of e-ticketing. All these three services will be launched by Railway Minister Suresh Prabhu tomorrow. The mobile app for paperless unreserved ticketing will also be available for commuters in Egmore and Tambaram sections of Chennai suburban railway. Developed by the Centre for Railway Information Systems, the paperless unreserved ticketing app 'utsonmobile' aims to eliminate the need for printing of unreserved tickets.